10 years. Can't believe its been ten years- a decade. When I got awed by something that I watched on screen. What kept on playing in my ears. And what I saw inside the cinema halls. That was LAGAAN. Way back in the year 2001 - one of the finest years Indian cinema has witnessed. I can remember how Aamir had kept Lagaan miles away from media and publicity. Nobody knew much about the movie except few things like it was shot in Gujarat's deserted area of Kutch. That its story was set in years when English ruled the country. [Another movie about Freedom movement I thought] I was studying my engineering back then. Many people don’t understand how time-consuming engineering education is. ;-D I was completely disconnected with TV then. You won't believe but I hardly could watch TV because I was living alone as a PG [though the family I lived with, insisted that I can go and watch TV anytime, but somehow I resisted myself]. 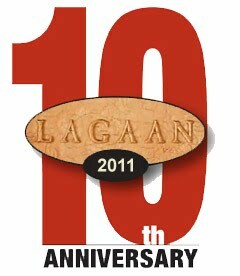 So for me - nothing but word of mouth was the only source [and local newspapers] for information about Lagaan. On one fine day I heard the first promo has come out, Kaisa hoga promo? kaisi hogi Gauri? [mad mad]. Someone told promo is very short. Just a bunch of rapidly moving frames with Big B telling 'Lagaan - Sau saal pehle ki ik aisi kahaani, jo itihaas ke panno mein kahin kho gayi thi' - whooo! Bachchan? [I do not like him 'that' much, u know]. But yes, he has that voice. my excitement was on its peak. I was counting days to the vacation. [the 'reading vacation' just before the exams] that I can go home and watch all happenings one by one. Vinnaithaandi Varuvaayaa - VTV remake is still on ! Eagerly waiting for the remake. Pratiek - please don't disappoint. btw, see the fan art I found on PremKatha's Wiki page.